Consumer credit outstanding grew on a seasonally adjusted annual rate of 7.2% over the month of December and by 5.8% over the fourth quarter of 2015. Over the year of 2015, consumer credit outstanding expanded by 6.9%. There is now $3.55 trillion in outstanding consumer credit. Growth in the outstanding amount of consumer credit over the year partly reflected an expansion in the outstanding amount of non-revolving consumer credit. Non-revolving consumer credit includes both student and auto loans. According to the report, non-revolving credit outstanding grew by 7.1% on a seasonally adjusted annual rate over the month of December and by 5.9% over the fourth quarter of 2015. Over the year of 2015, non-revolving credit outstanding expanded by 7.6%. There is now $2.61 trillion in non-revolving consumer credit outstanding. The increase in consumer credit outstanding also reflected growth in the outstanding amount of revolving credit. Revolving credit is largely composed of credit card debt. Revolving credit outstanding grew by 7.5% on a seasonally adjusted annual rate over the month of December and by 5.3% over the fourth quarter of 2015. 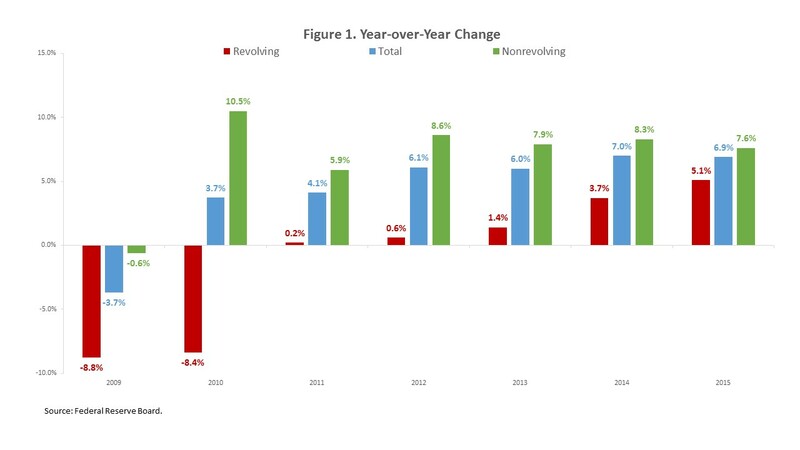 Over the year of 2015, revolving credit outstanding expanded by 5.1%. There is now $.94 trillion in revolving credit outstanding. An earlier post found that lending standards on acquisition development and construction (AD&C) loans tightened over the 3 months ending in December 2015. In addition, lending standards also tightened on commercial and industrial loans. However, standards on consumer credit products eased over the quarter. 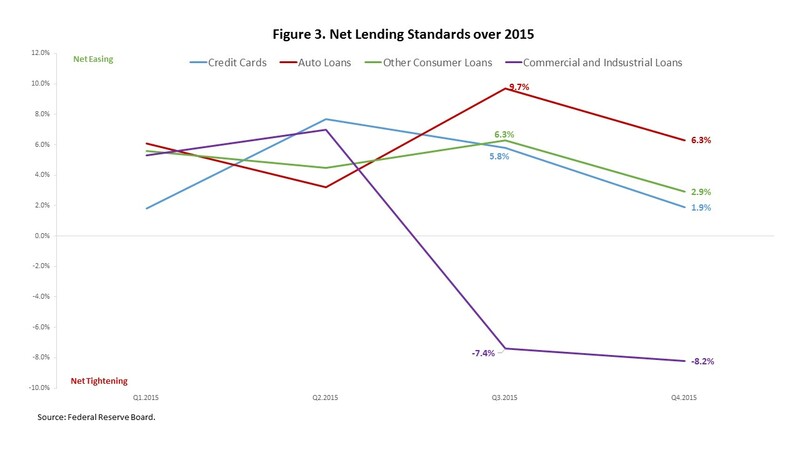 As illustrated by Figure 2 below, lending standards on auto loans eased by 6.3% on net over the fourth quarter of 2015. The net percentage represents the difference the portion of banks reporting that standards had eased and the proportion reporting that standards had tightened. Similarly, standards on credit cards eased by a moderate 1.9% on net while lending standards on other consumer loans eased by 2.9%. In contrast, lending standards on business’ commercial and industrial loans, which account for 20% of total net loans and leases at depository institutions and are the second largest major loan or lease category behind real estate, tightened by 8.2% over the quarter. 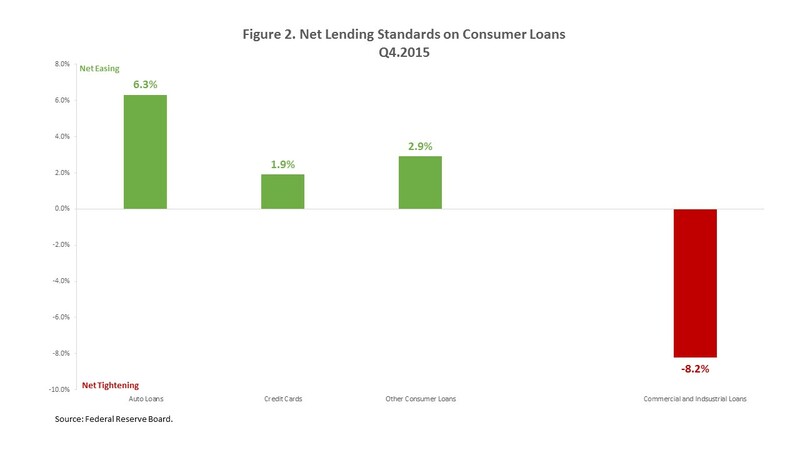 Over the year, lending standards on consumer credit products have continued to ease, on net. However, the pace of easing in the fourth quarter of 2015 was less than that in the 3rd quarter of 2015 for each category of consumer loans. Fewer survey respondents reported, on net, that lending standards on consumer credit products had eased. Meanwhile, the tightening in commercial and industrial loans that was recorded in the fourth quarter of 2015 is a continuation of the tight lending standards that prevailed in the third quarter of 2015 and a reversal of the net easing of lending standards recorded over the first half of the year.